Pancakes or waffles are my go-to on Saturday mornings. 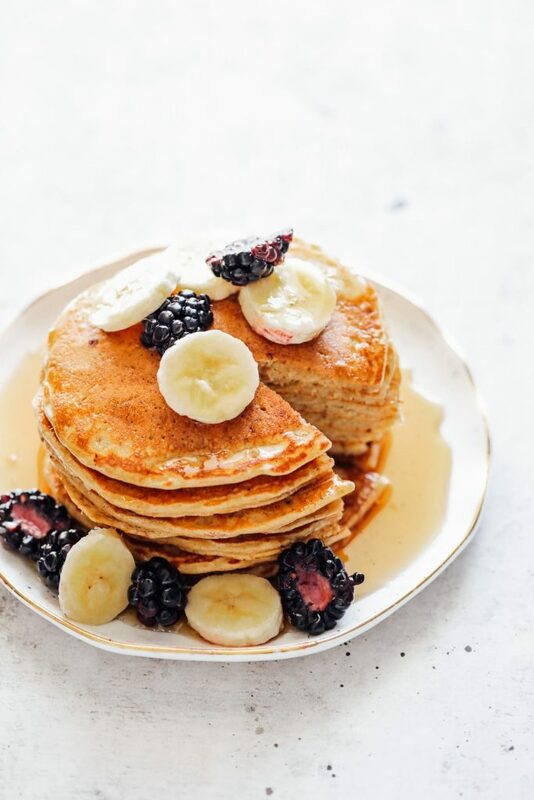 Not only are pancakes a family favorite weekend breakfast, they also make for a great “cook once, eat twice” meal. And they can be a super nourishing breakfast option. Gone are the days of Bisquick boxes and pre-made mixes. Today, our waffles are made with simple, wholesome ingredients that not only taste great but also nourish the body. By making and doubling the recipe for pancakes and waffles on Saturday morning, I’m able to set aside the extra for breakfast later in the week (who doesn’t love a pancake breakfast on Wednesday morning) or use the extra in the kids’ lunchbox (served as actual pancakes with fruit and maple syrup or served as a sandwich with nut butter and jam or cream cheese and sliced berries or bananas). 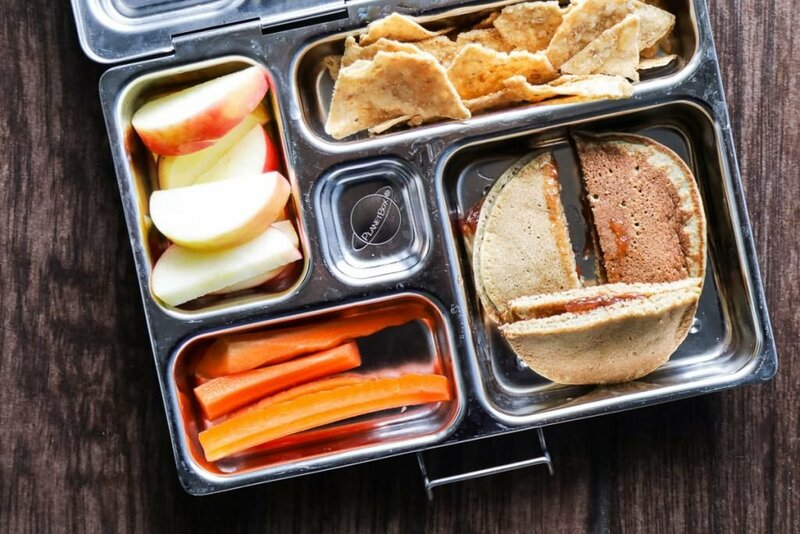 <–Learn more about simplifying the lunchbox and packing. Most weeks, I turn to my almond-oat pancake recipe. It’s a reader favorite, too. Being a believer in variety, and also the fact that my kids go to a nut-free school and can’t have nut-based pancakes in their lunchbox, I’ve been in need of a new recipe to circulate. 1. It’s made with einkorn flour. Einkorn is my favorite flour to work with when making traditional, flour-based baked goods. The sweet, ancient grain has a lighter texture and taste than modern day wheat, and contains a more favorable gluten ratio. You can find einkorn at some Whole Foods and health food stores, Earth Fare, Vitacost, and Amazon. Also, while we’re on this subject, we’re going to talk more about the specifics of einkorn in a future podcast episode with guest Carla from Jovial Foods. It’s so good and will give you a deeper respect, so to speak, for this ancient grain. 2. 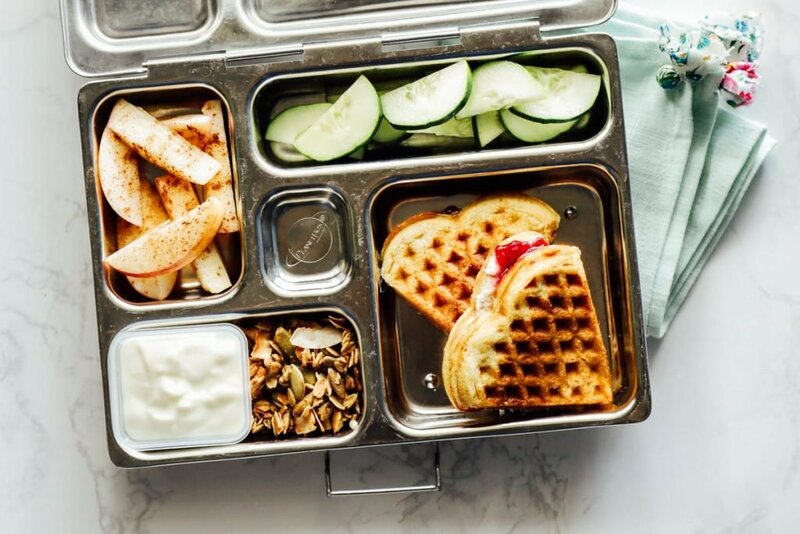 The leftovers are safe for a nut-free lunchbox. Whether you go the sandwich route or serve up traditional pancakes, this recipe is perfect for kiddos who attend a nut-free school or can’t have nuts. 3. Einkorn pancakes remind me of the Bisquick version. Growing up, my dad made Bisquick pancakes, from a box mix, every Saturday morning. This recipe reminds of the pancakes he made. 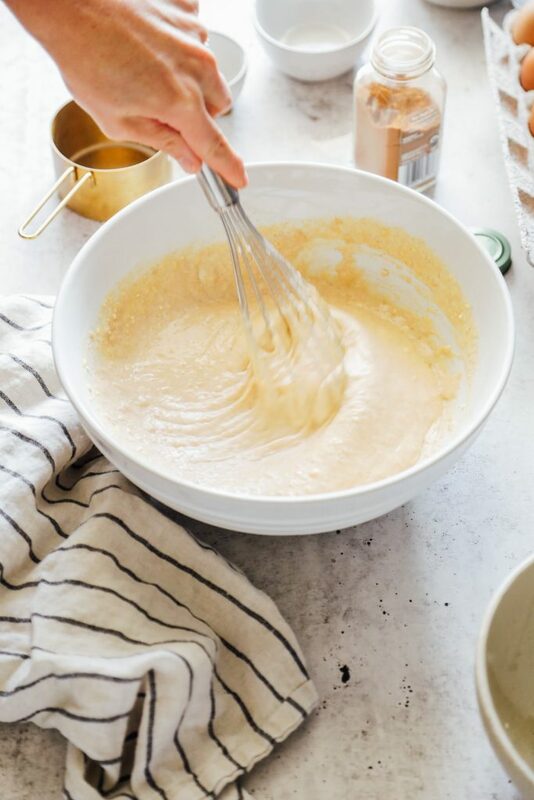 If you go with all-purpose einkorn flour, which is actually easier to digest, the pancakes will feel and taste light and fluffy–more like my favorite pancakes from childhood. If you go with whole wheat einkorn, the pancakes will have more of a rustic taste and feel. 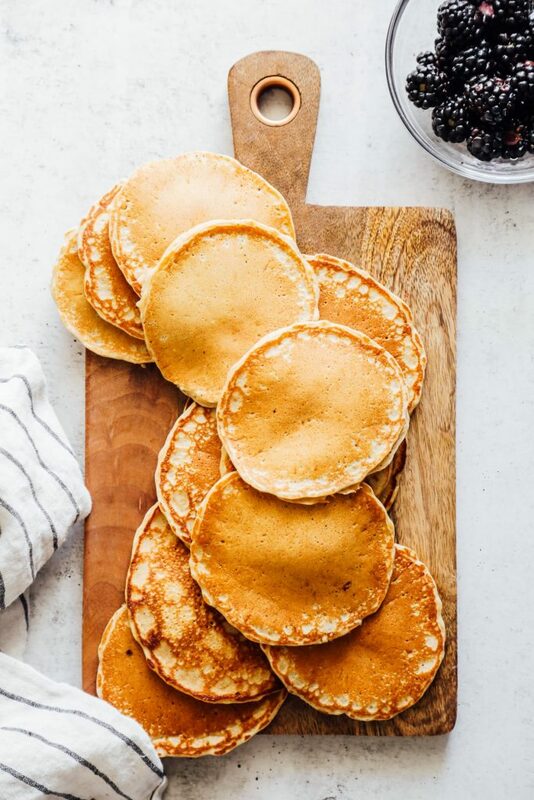 When it comes to storing and reheating pancakes, I like to store extra pancakes (once fully cool) in a storage container or bag in the fridge or freezer. For breakfast, pancakes can be reheated in the microwave, oven (350F until warm), or toaster. For a school lunch, serve the pancakes cold. By lunchtime, the pancakes should be at room temperature. If the pancakes are frozen, take them straight from the freezer to the lunchbox–they’ll defrost by lunchtime. 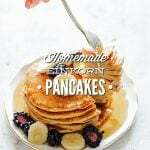 A make-ahead friendly pancake recipe made with ancient einkorn flour. Combine the milk and lemon juice in a small bowl. Let the mixture rest for 5 minutes. I love adding lemon juice to my pancakes. I find this helps to soften the batter. If you don't have lemon juice, you can skip this step and still make good pancakes. Meanwhile, in a large bowl, whisk the flour, cinnamon, baking powder, and salt. Add the milk to the flour mixture, along with the eggs, melted butter, maple syrup or honey, and vanilla extract. Allow the batter to rest for 5-10 minutes to thicken. Whisk or stir again before use. If you feel the batter is too thick (particularly when using whole wheat einkorn), add more milk until you reach the desired consistency. Meanwhile, heat a griddle (or large skillet) over medium heat. <--You may need to lower the heat while cooking the pancakes if your griddle gets too hot and begins to burn the pancakes, cooking them too fast. Use your best judgement with this. This will vary depending on your stove-top and griddle. 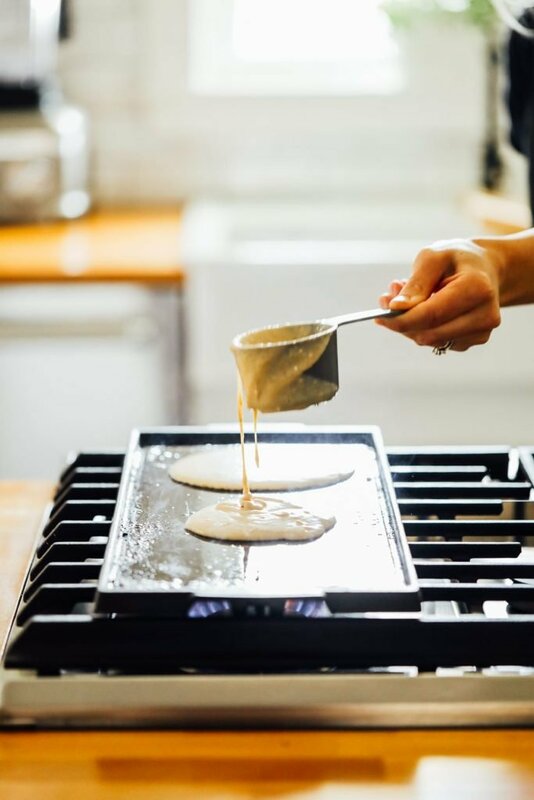 Add extra butter to the griddle to keep the pancake batter from sticking, then ladle the pancake batter in small batches on the griddle (I use a small soup ladle to do this, or a measuring cup). Cook each pancake for 2-3 minutes on each side, or until golden brown. 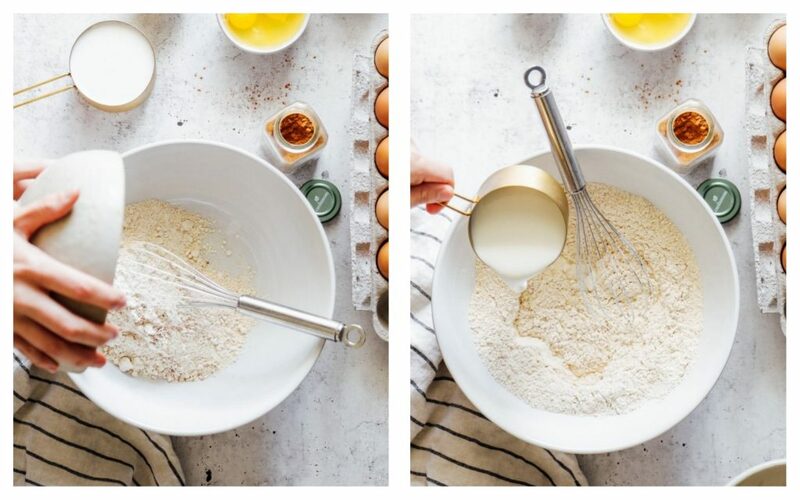 If you're not using the weight measurement (grams) for the flour, use the spoon and measure method. Spoon the flour into the measuring cup and level it off. Yay, Erica. I’m so glad you enjoyed the waffles. I’m looking forward to trying Einkorn based on your recipes! I stay away from refined All-purpose flour and use whole wheat or whole wheat pastry flour and many other flours when I bake. My question is, does the all purpose Einkorn flour go through the same sort of refined process as white all-purpose? I’d love to try it. Or, should I stick to the whole wheat Einkorn? Thank you!!!! 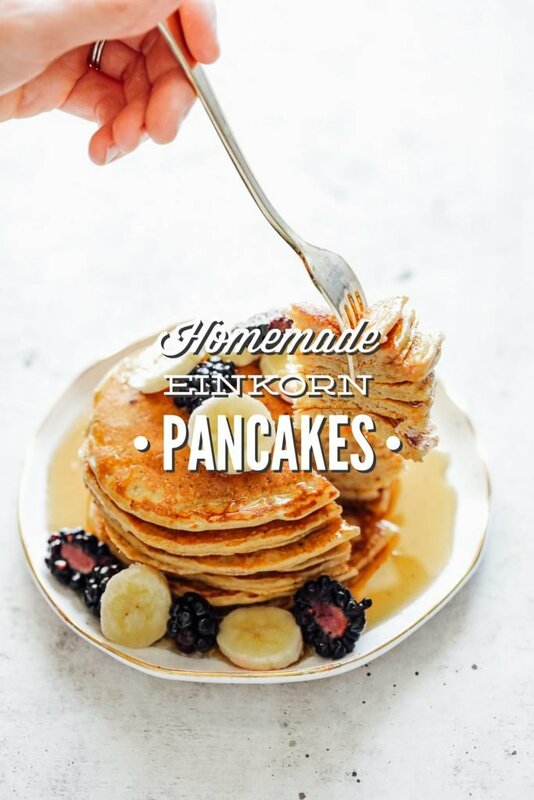 I have really liked all of the einkorn recipes that I have tried! I buy my einkorn from Thrive Market at a very good price. The lowest that I have found. Thanks for sharing your recipes! !